Within demand planning and forecasting, there is nothing more important than forecast accuracy. The success of any plan greatly depends on it. Forecasts allow you to determine opportunities and risks; they also help to effectively manage supply and demand. Gone are the days when manufacturers produced what they thought they could sell. That was then, if there was anything left over, Marketing made it go away. Furthermore, the world we live in has become highly competitive. Consumers are now more demanding, and have become increasingly less loyal. If you cannot give the consumer what they want, someone else will and you will quickly lose their business. Additionally, the life cycle of products has shortened. Therefore, today you need a highly accurate forecast more than ever before—the more accurate the forecast, the more successful and executable your plan will be. The objective of this report is to understand the forecast errors of other companies within your industry, and benchmarking them. This will help you determine where you currently stand. In other words, are you performing better or worse than others in the industry. 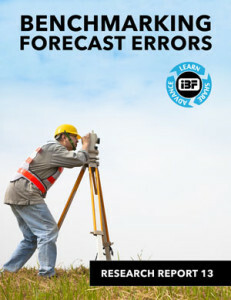 The forecast error benchmarks are used as a guide which may vary not only from industry to industry but also from company to company. To download and preview this research report, please click on the link below. To learn more about IBF Membership, please click HERE.